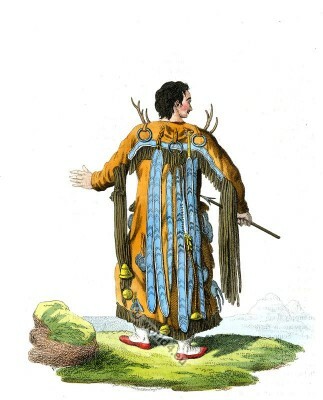 Back view of an Evenki Shaman in the Vicinity of the Argun. Home » Back view of an Evenki Shaman in the Vicinity of the Argun. 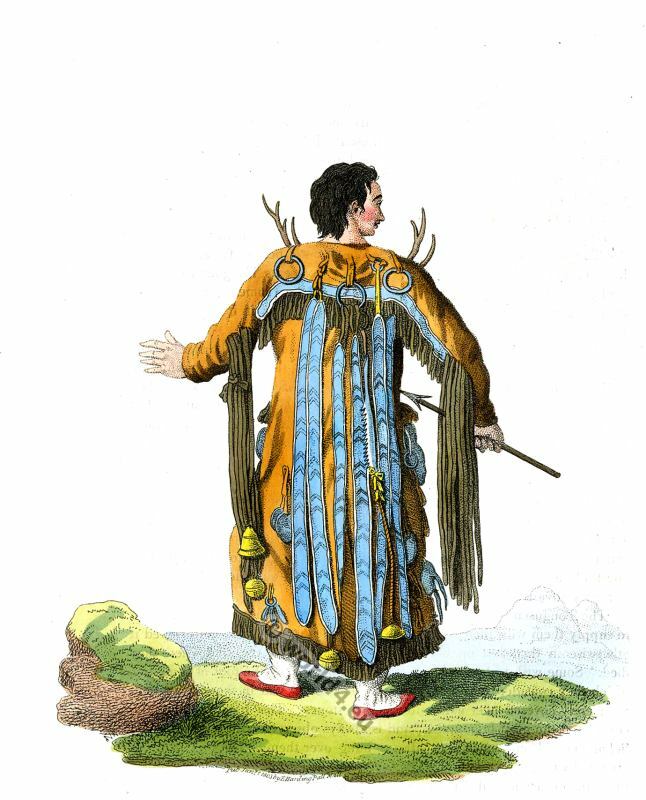 Back Figure of an Tungusian, Evenki Shaman in the Vicinity of the Argun. Formerly known as Tungus or Tunguz, Mongolian. Tungusic people of Northern Asia. Ergune or Argun is about 1620 km long right, southern source of the river Amur (Heilong Jiang) in Northeast China. The Evenks are recognized as one of the Indigenous peoples of the Russian North. The traditional religion of the Evenki is strongly influenced by shamanism. The Evenki shamanism was in research even as a classic, typical form. The term “Shaman / chaman / saman” comes from the Evenki. Un Devin Toungouse, auprès de l’Argoun, par derrière. POLYGAMY is permitted among the Evenki (Tongusians). Some of them have five wives, but the greater number have only one. These wives are purchased with animals and furs. The bride presents her husband with a suit of clothes, which is the first proof she gives him of her skill, as it is always of her own workmanship. The marriage is merely a civil agreement, neither preceded by, nor accomplished with, any religious ceremony. When the husband takes his wife home to his hut, he gives a repast to his friends. If he happens to be a Evenki of the south, the presents them with a horse. The Evenki pastors regale their companions still better, for several rein-deer are killed on the occasion. The hunter presents his guests with the produce of his chase, which is sometimes a wolf, and sometimes a fox; but whether it be the one or the other, they feast upon it as if it were the most delicious venison. The women are occupied in attending to the duties of the kitchen, in taking care of their children, in cleaning and drying their fish, in making the clothes of the whole family, and in dying the wool of their goats, &c. They are agreeable in their manners, and of a mild and lively disposition; but deep wrinkles make their appearance at an early period on their countenance, and bring on a premature old age. Nature has accorded them the power of pleasing but for a few years. The moment their children are born, they are placed in a cradle, and covered over with the powder of worm-eaten wood. At this age they strongly resemble the children of the Kalmucs, but their features improve as they grow older. The Evenki are acquainted with few maladies. Their old men seldom grow grey, and are so lively and active, that, at first sight, a stranger would suppose them to be still in their youthful days; but, notwithstanding this apparent vigour, they seldom attain to a very advanced age. The Evenki bury their dead in their clothes, and great care is taken to supply them with their arms, their pipe, &c. If they have not ordered it otherwise in their last moments, they are interred on the spot where they died. Some wish to be buried near their fathers, or at the foot of some tree which they consider as sacred ; others object to be laid in the ground, and are merely covered over with rubbish and stones. This mode of burial is considered the most honourable, and is always observed with regard to their Shamans. Their tambour is always hung over them. The funeral is unattended with any ceremony. The friends of the deceased regale themselves upon the occasion, and carry provisions to his grave.